Damascus steel is one of the greatest wonders of the ancient world. Invented more than 1,500 years ago, forgotten, and then rediscovered, it's a type of steel known for its strength, rigidity and durability. The blacksmithing techniques required to create and work Damascus steel are considerable. It's made by sandwiching together up to six different types of steel, heating them in a forge, and working them together on an anvil, folding them over and over to create a single metal blank containing a stratified layer of different metals. 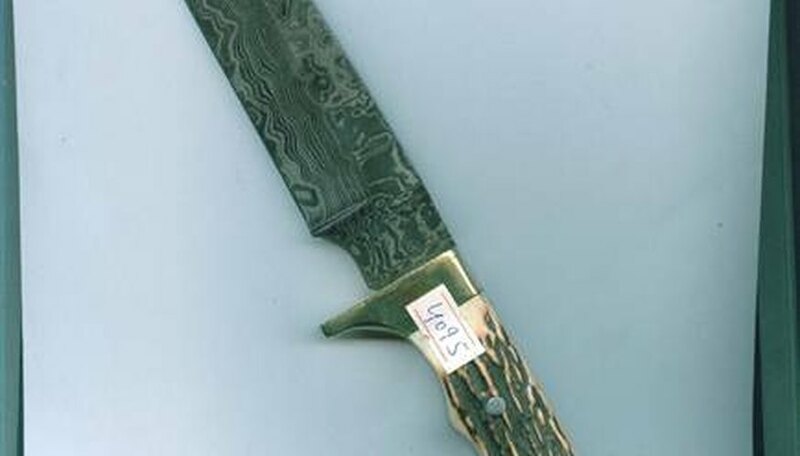 As this is a labor intensive process, a good knife made from Damascus steel may cost in excess of 1,000 dollars. The making of such a knife is the ultimate challenge in a blacksmith's ability to work metal. Don your protective gear and collect your steel slats. Each slat should be about an inch wide by 1/16 inch thick and 5 inches long. You are going to weld them together like a stack of cards. But they can't be stacked willy-nilly. Each different type of steel has different melting points, so the steels with the highest melting points should be the closest to the outsides, where the forge will heat them more quickly. For that reason, the black iron and 0-1 should be sandwiched in the center, with the D2 and the surgical stainless steel surrounding them, and the 440 carbon steel and the CPMS90V on the outside. Put on your welding mask and arc weld them all together at the very ends in a lattice pattern so they stay tightly connected. Get your forge going. Just in case you don't know how to do that (despite owning all these advanced materials and trying something incredibly difficult) we'll go over that. Stack several dozen lumps of coal in a circle around the center of the forge's hearth. Wad up a few pages of newspaper and place them in the center, then set them on fire. Feed the fire with tinder, and add kindling once the flame has caught. Push the coal around the fire to cook and eventually catch light. Make sure the air vent is engaged to keep the flames fed. Coal is tough to get burning properly, so this may take up to a 1/2 hour for a beginner. Thrust the bundle of steel slats or blanks, as they are called, into the center of the burning coals. Wait for the entire bundle to glow traffic cone orange. Retract the bundle, place it on the anvil, and begin to hammer it flat. Once it's flattened down to half it's original thickness, bend the metal in half by striking it while pulling upward with your tongs, and then hammering the two halves together. Repeat this process as many times as you can. Well made Damascus steel can be folded as many as 200 times. This means you will have to reheat the blank multiple times between foldings and this may take more than one work session to complete. Take the blank out of the forge and lay it across the anvil again. Once you've got the idea of how you want the blade to be shaped, use a chisel to score the outlines along the blank. Then use your chisel and hammer to systematically cut away all the extra metal scraps outside the outline. With this done, simply hold the blank at an angle against the anvil and hammer down along the exterior to thin the metal and form the edge. The edge may not be perfectly straight, there may be burs and imperfections, but these can be worked out with a rasp once the metal has cooled. Flip the blade over to begin working the shape of the handle. This shape will depend entirely on what material you intend to use for your handle. One of the easiest materials to work with is deer antler. Pieces can be obtained that are precut and predrilled. All you need do is slot the metal tang of the knife into the hole with a special bonding glue. If that's what you want to do, then you will need to form the handle into a thin length with squared edges. Just lay the blank down on the anvil and hammer straight down against the metal that will form the tang. Turn the blade over and do this again until you've addressed all four sides. Your blade is done, it just needs to be hardened and cleaned. Lower the hot blade into the quenching tank. The sudden cooling will cause part of the metal's molecular structure to crystallize and harden. This is a dangerous part of the process for Damascus steel as the different metals cool at different rates. For this reason you should make sure the metal is dark red and no brighter when you harden it. If it were lighter in color, meaning hotter, then the metal could crack. Also you should include mineral oil in the water of the quenching tank in a 1:3 ratio respectively. Inspect the blade. You may notice a black scale and slight discolorations. Though a stratified look in Damascus steel is desired, there will likely be some carbon stuck to it left over from the forge. Remove this with a thorough scraping using your rasp. With this done simply work the rasp over the edge, pushing the rasp in the direction the edge is facing, from the hilt toward the tip. This will help to define the edge and complete the knife. From here you can make a handle from whatever material you wish. Once the knife blade has been shaped and hardened, the handle can be connected. There are dozens of different types of materials and methods in which a handle can be added, and is not normally considered until the later production stages of the blade. You can use semi-precious stone, milled stone, soft wood, hard wood, rubber, plastics, other metals, horn, bone or ivory.